Going through this for the first time, I had no idea when or how to start solids with my son. 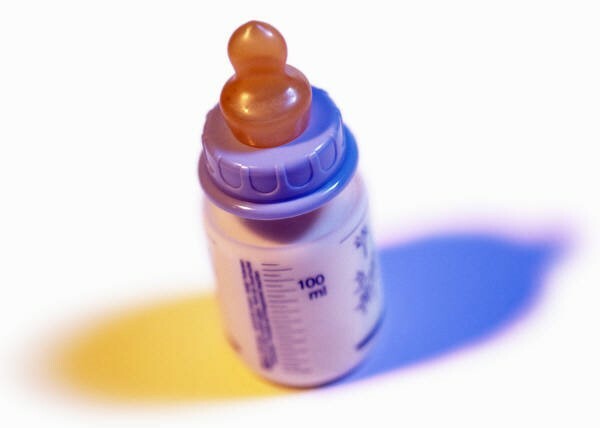 I had heard that formula was sufficient in terms of nutrition for the first year of life, but that solids should be introduced within that time period to begin familiarizing the child. I was told to start at 4 months, then I was told to start at 6 months. I was told to start with rice cereral, then I was told to start with veggies. I was told to make my own baby food, then I was told to buy organic pre-made food. So confusing! (Like everything associated with new parenthood, I am learning). So I spent some time reading about it and discussing it with seasoned mothers, and here is what I came up with for our situation. When to Start. My son had some gastrointestinal issues early on, so I definitely wanted to wait as long as was reasonable to start him on solids. I figured that waiting would help ensure that his digestive system was built up solidly. Plus, I remember reading somewhere that formula-fed babies who start solids before 4 or 4.5 months have a greater risk of childhood obesity. The medical community recommends starting your baby on solids between 4 and 6 months, or when “signs of readiness” are shown. For us, 6 months seemed reasonable and when our son seemed ready – as he had begun watching us intently as we ate, and mimicking our chewing movements. Store-Purchased vs. Home-Made. To make or not make our own baby food? I never imagined I would be the type of person to make ANY type of food, let alone baby food. Yet, the more packaged baby foods I looked at, the fewer options I felt I had. I wanted organic (which, by the way, all packaged baby foods are required to be), and I wanted a variety of single ingredient vegetable solids to start him off with. I found many single ingredient fruit options, or dual vegetable options, but not the single vegetable solids I was looking for. Also, I wanted the ingredients to be limited to simply water and the vegetable itself – no additions. Finally, I needed to find food with BPA-free packaging. As simple as these requirements seem, I couldn’t find much that met them! Ultimately I found Sprout Baby Food, which met all my requirements. The only problem was, my local Whole Foods markets only stock two types of single ingredient Stage 1 vegetables, sweet potatoes and squash. So I stocked up on those as back-up as it dawned on me that if I wanted more control, I was going to have to make the food myself. Making Baby Food. Anyone who knows me knows that I CANNOT cook, so simplicity was the name of the game for me here. I was looking for a baby food processor that was BPA-free and that would be E-A-S-Y. Finally, I stumbled upon the Baby Brezza One Step Baby Food Maker. I’ve listed out all the details of this great device under my #1 purchase for 3-6 month olds in another post, but suffice it to say that it is truly a 1-step process (as in load the veggies, press a button, and in 15-25 minutes you have a beautiful homemade puree). I can’t recommend it enough. Why not rice cereal first? I know, I know, I heard from everyone that rice cereal was the “right” starting point. But, I didn’t feel like there was much nutritional value, so I decided to go straight to veggies. That said, I would like to introduce him to baby oatmeal. What are the Color & Day Rules? So the Color Rule, as I’ve heard it called, simply refers to keeping your baby on a certain color of vegetables or fruits before starting another one (e.g. you may begin with GREEN veggies, and then move to ORANGE ones after that). I think it’s more to keep track of what your child has tried; I know that I haven’t really followed any color rules to date, although I have coincidentally started him with quite a few greens. As far as the Day Rule goes, you should give your baby one type of food a day for 3-4 days to ensure there is no allergic reaction before moving on to the next. This will allow you to monitor your child and also to identify the culprit should some sort of allergic reaction occur. Making the Introduction. Make sure you have everything ready: BPA-free food container, BPA-free baby spoon, waterproof bib, a sponge, and plenty of paper towels (and of course a high chair). I like to begin feeding time with a bit of formula (or you can do breastmilk); I feed him enough so that he is somewhat satiated but still wanting more. Then I give him the puree. I let him tell me by his reaction whether or not he likes it, and he also lets me know when he’s had enough. Then aftewards, I typically “top him off” with the rest of his bottle. This routine works well for us, and now he starts getting excited as soon as he’s sitting in his high chair (also reviewed as part of a previous post – #3 on the list). So far, so good. I am excited to begin him on oatmeal, chicken and turkey (both are suitable for Stage 1), and legumes. He is excited about all of it and his squeals prove it – as he splatters pureed green beans all over himself, his chair, and Mommy and Daddy.